Many CAD systems – including BricsCAD – use the Ctrl key to change how a drawing or editing command operates. But how do you know when more options are available? BricsCAD provides a on-screen Tips widget that shows your options. For example, pressing Ctrl while selecting a solid changes the entities selected from the entire solid to specific faces or specific edges. Where is the Tips widget? The Tips widget pops up during multiple actions in BricsCAD. 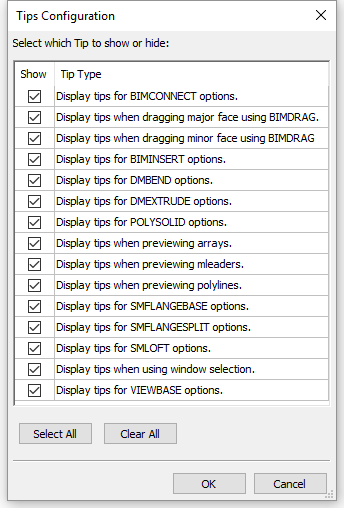 It is available when dragging major/minor faces using BIMDRAG, for POLYSOLID options or for DMEXTRUDE options. In the video, Ralph Grabowski shows you how Tips can aid you during window selection. You can view all the possible actions that display Tips inside the Tips Configuration dialog box. To see this dialog, simply right-click on “TIPS” on the extreme right-hand side of the Status bar, and click “Configure”. As your skill with BricsCAD increases, you may find that you don’t need to see a specific Tip. Click the ‘x’ while the Tip is active and you’ll dismiss that specific Tip for good. Of course, you can always activate it again in the dialog box. BricsCAD V17 introduced new Tips for polylines, multi-leaders and associative arrays. In the video, Ralph shows how the Ctrl key works when you are selecting any of these entities. While hovering over one of these entities, the Ctrl key gives you the option select the entire entity, or sub-entities within the larger entity. This functionality is consistent with the way that Windows works, and it gives you a simple way to get your work done more easily and… faster. Need more information about how Tips work in BricsCAD? You can find more about the Tips widget at the bottom of the User Interface page in the BricsCAD On-line Help. As long as you’re on the User Interface page, explore some of the other key features of BricsCAD – there’s a lot there that you may not know about!